One of the more interesting and thus passionate discussions when thoroughbred historians and knowledgeable turf enthusiasts get together is which horse was the best ever on the race courses and tracks of the world. Much like who was the greatest footballer, or hockey player, or baseball player, who was the greatest thoroughbred race horse discussions evoke passion from the admirers of the horse they are nominating as the best. Many will point to Sea-Bird II, Secretariat, Man O’ War, Nearco, Nijinsky, Brigadier Gerard, Mill Reef, Native Dancer, Dancing Brave, Seattle Slew or Ribot as their choice. Recently Zenyatta, Frankel and Black Caviar have entered these debates as well. Nobody is wrong, nor are they right, it is simply a matter of opinion and therein lays the fun of such chats. I have only seen video of many these greats I have mentioned here so I can only go by on this media and of course the written essays of people in the corner of their choice of the best. A strong case is made for Ribot as he was undefeated in a sixteen race career against the best of his generation. Ribot went on to become an influential sire and, since the tracing of today’s top bloodlines is the point of this web-site, I will highlight him here. I am not agreeing nor disagreeing that he was the best, but no one can deny his contribution to the champions of today. Ribot was another masterpiece bred by Federico Tesio, at his Dormello Stud in Italy. He was foaled on February 27, 1952 and was by Tenerani – Romanella by El Greco. The first two generations in Ribot’s pedigree were all Tesio bred thoroughbreds. Ribot is a direct male line descendant of St. Simon through Rabelais – Havresac II – Cavaliere d’Arpino – Bellini then Tenerani. The only truly sad part of the story of Ribot is that Tesio did not live to see him race, as he passed away in 1954, a few months before Ribot began his racing career. Tesio was said to have trepidation as to the bay colt’s chances of success. Ribot was not a glamorous looking individual but did have the build of a colt who could become a good racer. Back in 1932 Tesio, known as the “Wizard of Dormello”, had brought in a partner to his racing and breeding empire. Marchese Incisa Della Rochetta would be instrumental in providing the necessary funds to continue the breeding operation on the scale needed to compete at the highest level. His contribution cannot be ignored and he always referred to Tesio’s genius as a horseman and certainly as to broodmare and sire mating. Ugo Penco became Ribot’s trainer after the death of Tesio, and the colt ran in the name of Lydia Tesio and the Marchese. The first race appearance by Ribot was at San Siro where he won the five furlong Premio Tramuschio by a length. As the races became longer, Ribot would win by larger margins of victory in his two year old season. He capped off his year with his victory in the seven and one half furlong Grand Criterium also at San Siro, beating another quality colt Gail. Ribot had not been nominated for the classic races for three year olds so he had to run in lesser events until the Prix de l’Arc de Triomphe at Longchamps. This was his first race outside his native country. Reports of the race claim that Ribot won so easily that his jockey, Enrico Camici, eased the horse near the finish in order to not over use him. The Gran Premio del Jockey Club, back in Italy, was his final race of the year and he won by fifteen lengths over a heavy, deep track. Ribot was now a national celebrity and acquired the nick name “Il Cavallo Super” by his adoring fans. Kept in training as a four year old, he reeled off three easy victories in Italy before capturing the Gran Premio di Milano, Italy’s top weight for age race. In the race he beat Tissot by eight lengths. A trip to England for the King George VI and Queen Elizabeth Stakes was the stage were Ribot demonstrated to the Ascot patrons his speed and class. On soft ground, Ribot won the one and one half miles event by five lengths beating High Veldt and Todrai. This was his fourteenth consecutive victory tying him with Tesio bred Nearco’s record. Back to Italy and an eight length demolishing of the field in the Premio del Paizzale, setting him up nicely for his final race, the Prix de l’Arc de Triomphe. The field in the 1955 edition was a much stronger group than the year before containing Tanerko, Talgo, Career Boy, Master Boing, Fisherman and Oroso. The official margin of victory by Ribot is charted at six lengths but, many observers of the race argue that the margin was closer to eight lengths. No matter what the margin of victory was, Ribot had won the Arc a second time and in consecutive years. Hailed as one of the all time (if not the all time) greats, Ribot was retired to begin his new career as a much highly anticipated sire prospect. Ribot was not sold or syndicated but was leased for one year to Lord Derby’s Woodland Stud, then went back to Dormello for the next three seasons. A deal was struck by John W. Galbreath, the owner of Darby Dan Farm in Kentucky, to lease Ribot for five years. The cost of which was $1,350,000, a huge price for essentially a quarter or less of the stallion’s expected life as a sire. As with what seems like many top horses, Ribot had a fiery temperament which became more dangerous as he aged. This led to his remaining at Darby Dan Farm after the original five year lease had expired. Insurance companies would not underwrite the risk to the stallion for any travel since he had become far more valuable as a sire, a deal needed to be reached in order to keep him in Kentucky. He remained at Darby Dan until his death at the age of twenty. Although he was not a huge horse, just a shade below sixteen hands, he was extremely powerful and his territorial behaviour would bring out the worse in his temper, if he did not get his own way. He absolutely despised being around other stallions, or any other breed of animal except for mares during breeding season. Normally such stallions are sold off if they are not productive. However Ribot was such a great success as a sire that special consideration and protective measures for his handlers were consistently needed to ensure their safety. Furthermore, Ribot seemed to pass on his aggressive disposition to his offspring more times than not. From his first crop, the only crop sired in England, came Molvedo. Molvedo became the champion two year old in Italy and at three he won the Gran Premio del Jockey Club, the Grand Prix de Deauville and the Prix de l’Arc de Triomphe. He was the top rated horse on Timeform’s year end list of 1961 at 137 lbs. Molvedo would be the first of two Arc winners sired by Ribot. Full brothers Ribocco and Ribero each won the Irish Derby and the English St. Leger Stakes in consecutive years (1968 and 1969). Ribocco also added the Observer Gold Cup and the Washington Singer Stakes. A third full brother was Libra’s Rib (Princess of Wales Stakes). Another St. Leger winner by Ribot was Boucher who added the Beresford Stakes, the Nijinsky Stakes and the Desmond Stakes to his resume. He went to Australia for stud duty. Prince Royal II was Ribot’s other Arc winner in 1964. Prince Royal II also won the Gran Premio di Milano, the Premio Tevere and the Premio Besana in Italy. He was champion three year old in Italy, Prince Royal stood eight years in Kentucky and nine years in Japan during his stud career. Arkadina was from the great broodmare Natashka by Dedicate. Arkadina won the Athasi Stakes and place in the Irish 1000 Guineas and the Irish and Epsom Oaks. She later produced Dark Lomond by Lomond, the 1988 Irish St. Leger winner. Queen Sucree came from a royal family as her dam was Cosmah by Cosmic Bomb. Cosmah was out of Almahmoud, so Queen Sucree is from the family of Northern Dancer, Halo, La Prevoyante, Machiavellian and Danehill. She did her part to uphold the family honour by producing Cannonade by Bold Bidder, winner of the 1974 Kentucky Derby. Arts and Letters became a classic winner for Ribot in North America for his breeder/owner Paul Mellon, when he won the Belmont Stakes. He would also win the Travers Stakes, the Jockey Club Gold Cup, the Blue Grass Stakes, the Metropolitan Handicap and the Woodward Stakes during a very successful racing career. Arts and Letters went on to have a good sire career with his best on the track being Codex (Preakness Stakes), major handicap runner Winter’s Tale (Suburban, Brooklyn and Marlboro Cup) and Lord Darnley (Widener and Gulfstream Park Handicaps). Another highly successful brother team sired by Ribot was Graustark and His Majesty. These two did their racing in North America and were bred at Darby Dan Farm. Their dam was the good distance stakes winning mare Flower Bowl by Alibhai. She also produced two time champion filly Bowl of Flowers by Sailor. Graustark was foaled in 1963. He won the Arch Ward Stakes at two but came out of the race with shin splints and was put away for his three year old season. Coming out running for his three year old début, he won the Granada Purse at Hialeah and then the Bahamas Stakes. A much anticipated show down with Buckpasser was hoped for in the upcoming Kentucky Derby. Unfortunately Graustark suffered a serious coffin bone break in the Blue Grass Stakes, thus ending his career. Buckpasser was to miss the Triple Crown races as well with an injury, but not as serious as the injury Graustark sustained. Syndicated for $2,400,000 Graustark went to Darby Dan Farm to stand stud. Graustark was quite successful at stud and he did have some major influence as a sire with three year old champion Key to the Mint, Avatar (Belmont Stakes), Jim French (Santa Anita Derby, Remsen Stakes) and Proud Truth (Breeder’s Cup Classic). As a broodmare sire Graustark was to have a bigger influence, with the likes of Glint Of Gold, Diamond Shoal, Hero’s Honor, Mizzen Mast, Oh So Sharp, Sunshine Forever, Bein Bein, and Bint Pasha who were all produced by his daughters. His Majesty was not as accomplished on the track as his brother but he did do extremely well as a sire. His most important win on the track came in the Everglades Stakes as a series of injuries hampered his racing, finally ending with a bowed tendon when he was four. Pleasant Colony would make His Majesty a sire of a classic winner when he won the Kentucky Derby and the Preakness Stakes on his way to champion three year old honours. Pleasant Colony later became very successful as a sire getting seventy-three stakes winners including Pleasant Tap (Jockey Club Gold Cup, Suburban Handicap etc) a successful sire in his own right, as he has sired Tiago (Santa Anita Derby) and Tap Dance City (Japan Cup) among many stakes winners. Pleasant Colony also sired Pleasant Stage (Breeders Cup Juvenile Fillies), St. Jovite (King George VI and Queen Elizabeth Stakes, Irish Derby), Colonial Affair (Belmont Stakes), Behrens (Gulfstream Park Handicap twice, Dwyer Stakes, Oaklawn Park Handicap etc), and Pleasantly Perfect who won $7.8 million (Breeder’s Cup Classic, Dubai World Cup and Pacific Classic) in his racing career. Pleasant Colony as a broodmare sire is responsible for daughters that produced Forestry (Dwyer Stakes, King’s Bishop Stakes) a successful current sire, Summer Colony (Personal Ensign Handicap), Cash Run (Breeder’s Cup Juvenile Fillies), and multi stakes winner Bowman’s Band. Pleasant Colony has been a prime conduit for the continuation of the Ribot male line. His Majesty also sired Majesty’s Prince who had double wins in the Canadian International, Man O’ War and Sword Dancer Handicaps. Tight Spot was the 1991 Male Turf Champion when he won the Arlington Million, Eddie Read Handicap and the Del Mar Derby. The most prominent source of the blood of His Majesty in today’s top pedigrees is as the sire of Razyana, dam of the phenomenal sire Danehill. Tom Rolfe was a small horse at 15.2 hands, but would prove to arguably be Ribot’s best son on the track and as a sire. He was Champion Three Year Old in 1966 with his major victories coming in the Preakness Stakes, the American Derby, the Arlington Classic and the Citation Handicap. He took a shot at the Prix de l’Arc de Triomphe but came up against Sea-Bird II and finished sixth after briefly holding the lead. As a four year old, Tom Rolfe added the Salvador Handicap and the Aqueduct Handicap to his win total. Tom Rolfe was retired to Claiborne Farm where he began a successful career as a sire and the main progenitor of the Ribot male line. Tom Rolfe did not inherit his sire’s noted temper as he was reported to be easy to work with although his direct male line champion grandson Alleged by Hoist the Flag was noted for his sour temperament. Hoist the Flag was Tom Rolfe’s best son and carried on the Ribot name to future male line descendants. Other good sons on the track by Tom Rolfe were Droll Role (Canadian International and Washington DC International), and Run the Gantlet (Washington DC International, Man O’ War Stakes, Tidal Handicap, and United Nations Handicap etc). 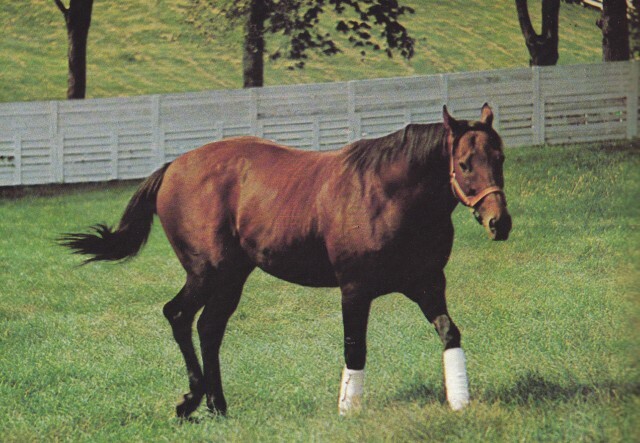 Tom Rolfe was also the dam sire of Forty Niner, Life’s Magic, Silverbulletday and Niniski. As with many other exceptional champions, Ribot was expected to sire at least one horse to equal or surpass his glorious success on the track. That he did not was seen by many as a failure. Such lofty expectations skew the actual accomplishments he did achieve as a sire. He got 16% stakes winners from his total foals which for any sire is a major success. His male line lives today, though just, and his influence through sons and daughters is still prevalent in some of today’s top racing thoroughbreds. Ribot was not a warm and fuzzy sort of fellow, but he is still remembered with affection and awe. Ribot had explosive speed and could carry his speed to long distances, which he was able to pass on to many of his descendants. The final masterpiece of the incredible breeding career of the incomparable Federico Tesio. Ribot is one of the very few thoroughbred champions to succeed as a sire after a dominating racing career. Those who claim him to be one of the greatest, have a very legitimate argument. Yes he was a great Race Horse and Sire and yes I just Love the ancestry of the thoroughbred. since I Have done this since 1961. and yes I would like to se about some of the Horses that have bee forgotten. The genius of Tesio. Ribot certainly was a masterpiece.